A HEAT expert has called on Australian Open organisers to change their policy on playing in extreme conditions, even postponing full days if temperatures became too hot. 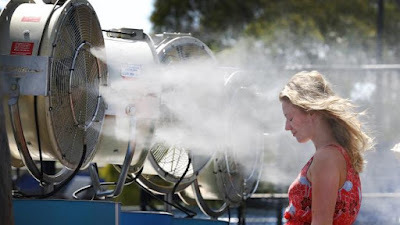 Australian National University’s Dr Liz Hanna says the Open’s extreme heat policy — which currently kicks in at 40 degrees and a `wet bulb’ temperature of 32.5 degrees — isn’t acceptable. “Their (tennis players’) bodies are the instruments of their trade,” she told AAP. “When we do get those days around 40, it really is inappropriate to expect them to play. Dr Hanna points to a world athletics policy that delays competition when the ‘wet bulb’ — a complex measurement of heat, humidity and wind speed — hits 28, as a better standard. 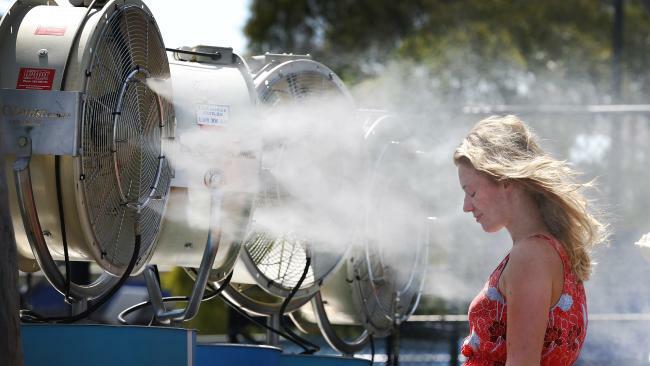 Unsurprisingly Australian Open organisers say a long-range forecast for hot weather won’t compromise next month’s tournament. Open director Craig Tiley said he was preparing for three days of above 35-degree heat as well as the odd thunderstorm but most of the tournament “in the mid to low 20s, perfect weather for tennis”. But as Australian summers get hotter, public health specialists are calling for the application of new rules to protect players. In sweltering conditions during the 2014 event, players vomited and hallucinated on court. Tiley says the Open is better set up to cope with extreme heat than ever before. The Melbourne Park facility boasts a world-best three retractable roof stadiums, with more shading than previous years to help fans cope with hot weather. The tournament is as popular as it has ever been with fans. A cooler-than-normal 2015 edition, with average temperatures of just 24.5 degrees, helped set a new record attendance. Less than 50 days out, there’s also a full field of stars lining up for 2016’s first major. Canadian fan-favourite Eugenie Bouchard and former US Open winner Juan Martin Del Potro have put their names forward after long injury spells. Todd Woodbridge said they’d be welcome additions. “The women’s game needs some younger stars to lift ... Eugenie is certainly one of those,” he said. World No. 1 Serena Williams will also end her post-US Open hiatus in Australia.